At stay at Anmaria Beach Hotel is a pleasure with beautifully decorated and well-furnished rooms that are spacious, clean and comfortable. Anmaria Beach Hotel resides just 55km from Larnaca International Airport, meaning you can be relaxing in your hotel room in just an hour from arriving in Cyprus. There are a top-notch restaurant and poolside bar on site serving international and local dishes as well as many more great options around the hotel that cater to tastes from around the world as well as serving traditional local favourites. 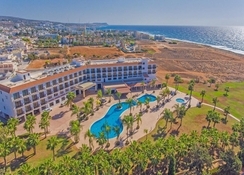 The hotel makes accessing several stunning beaches easy with the warm sands and crystal clear Mediterranean waters just a short walk away and are ideal whether you want to just laze on the beach or try your hand at one of the water sports on offer. Those who have come for the world famous nightlife will love the myriad of nightclubs on offer, you can check out just one or several all in one night. 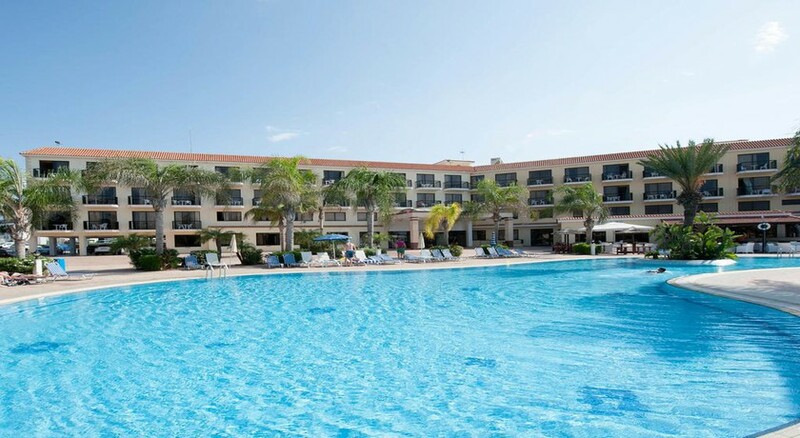 Anmaria Beach Hotel is located centrally along the coastal region of Ayia Napa. The hotel sits just 55km from Larnaca International Airport, meaning it can be reached in under an hour by car. 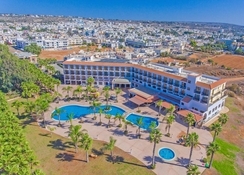 The hotel is just a short 100-metre walk to the nearest beach, however there several other beaches within walking distance that are worth visiting. There are many restaurants and bars all within easy walking distance from the hotel as well as numerous shops along the main road of Nissi Avenue which run just behind the hotel. Those looking to party the night away will find multiple nightclubs within just a mile’s radius. At stay at Anmaria Beach Hotel is a relaxing affair with rooms that are a pleasure to stay in. Rooms are beautifully decorated with light and breezy atmospheres. They are furnished with all the amenities you’ll need for a comfortable stay such as international electrical outlets, telephone, safe deposit box, tea and coffee making facilities and many more. Standard rooms feature either a double bed or two twin beds and are comfortably spacious with a private balcony or terrace that extends the space to the outside. Rooms here generally offer guests a choice between land, sea, garden or street views. Anmaria Beach Hotel has a themed buffet restaurant as well as a poolside bar offering guests a great selection of drinks and snacks. Out and about in Ayia Napa, guests will find many superb places to wine and dine. Flames restaurant, for instance, caters to both international and local tastes. De Medici is an Italian restaurant serving Italian favourites whilst providing incredible views over the Mediterranean Sea and authentic Mexican can be found at Los Bandidos to name but a few options. Refreshing late night drinks can be had at top bars such as Nissi Bay Beach Bar which combines great drinks with great sea views. At Anmaria Beach Hotel guests can stay active at the gym or on the tennis courts or simply relax at the spa or cryosauna. Fun for all members of the family can be had with the daily entertainment programme, which has activities and events put on both during the day and evening such as live music, singing and folkloric shows. Several fine golden sand beaches are within walking distance and offer various water sports activities. Those looking to keep the Cypriot vibes going through the night can do so at one of the many top nightclubs such as River Reggae and The Castle Club. Cracking hotel, location was great, just on the outside of the main town centre and on the sea front, gym and indoor pool area was superb. I would stay there again when I go back. Fantastic location within easy reach of busier part of Ayia Napa but set back from main road leading onto beach. Very good food choices for all meals and bar snacks excellent in the afternoon if you missed lunch. Eddy who organises the entertainment is fantastic and does a great job and always has time to chat to everyone and has a great sense of humour.